This entry was posted in empire and war crimes and tagged coup against nicolas maduro. Bookmark the permalink. Had I watched the Stupor Bowl, I would have expected to see a commercial about America’s need to ‘rescue’ Venezuela in our upcoming *public* ‘intervention’. The commercial would be scripted and produced by Stevie B. (aber natürlich), who was once called “the Leni Reifenstahl of the Tea Party” by no less than Breit Bart himself. mornin’, mongo, a free dog. as in ‘stevie bannon’, ya cheeky devil? eric london had a lot to say this a.m in his ‘US issues new threats of war for oil against Venezuela’ at wsws, but he doesn’t say where he’d scored some of what he’s claiming in regard to ‘colombian troops at the border’ and ‘maduro’s death squads against protestors at night’. 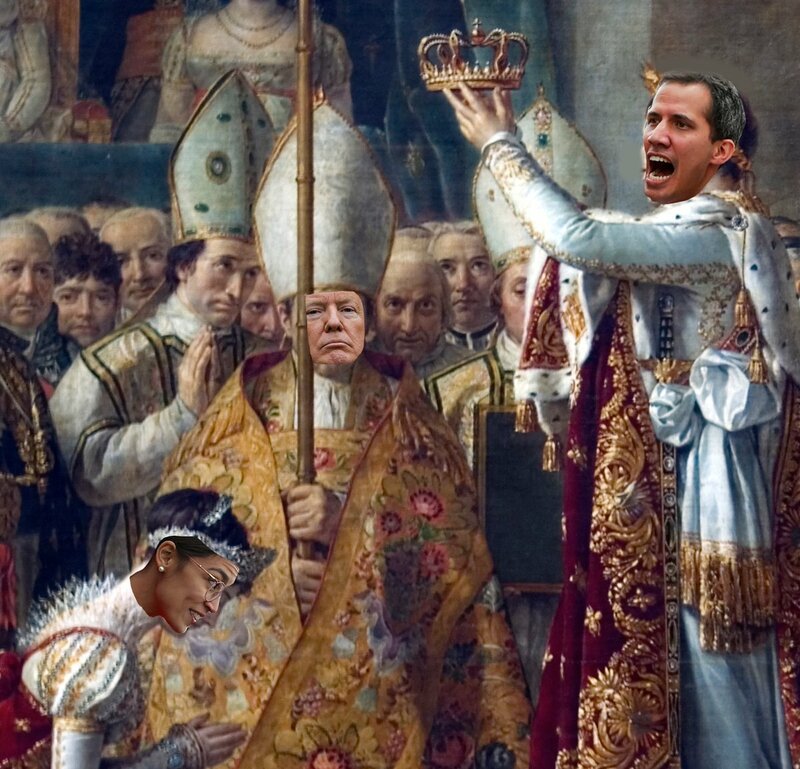 “Self-proclaimed “interim president” Juan Guaidó, the US and their allies in South America and Europe are preparing a new provocation aimed at forcing the Venezuelan military to abandon Maduro, with Guaidó announcing that the US will deliver aid at three locations along the Venezuelan border in the coming days. 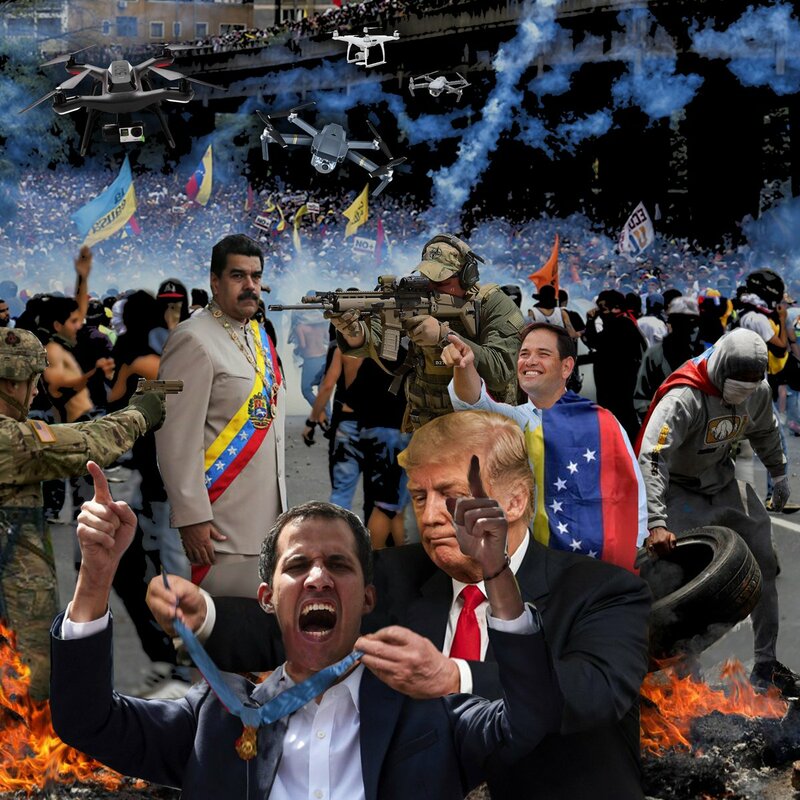 “The Brookings Institution explained that the present stage of the coup operation is aimed at “building an off-ramp for the Maduro regime.” In the parlance of US imperialism, countries whose leaders do not take the “off-ramp” are, like Saddam Hussein in Iraq, Gaddafi in Libya and Assad in Syria, subject to a hailstorm of bombs and missiles from the air and US troops or proxy armies on the ground. but it sounds as though the parties want a greater war w/ china and russia. i can’t say if china would intercede save for diplomatically, nor if russia would be prepared to, but iirc (hardly likely) jorge martin at marxist.com upthread dinnae think so. further assassination attempts on maduro *do* seem likely, though. and most of the western capitalist nations’ ruling class would weep crocodile tears…on twitter. if that. is that a george patton doggie? no, the ptb wouldn’t give a toss. lol. wish any of the USian war criminals ‘could’ see the inside of a court-room at the hague, but as we’ve seen, some of the judges are…mmmm…biased ahead of time, might not let damning nor exculpatory evidence be heard. (as w/ kagame and milosevic, exonerated of war crimes after he’d died in a cell at the hague). even though it’s a totally unrelated distraction, and i love the waka, thank you, juliania. addendum: you might want to read Michael Hudson’s wide-ranging Feb. 1 Trump’s Brilliant Strategy to Dismember U.S. Dollar Hegemony’ at counterpunch in the OP to understand why ‘indicting bolton; IS relevant. Thanks, wendye! I only posted it here as the last appropriate place is a bit far back – but Waitangi Day is my favorite holiday, hands down, and they did a lovely dawn ceremony this year, with PM donning an apron and serving out the breakfast scrambled eggs. Also, though, more on topic, there are two articles over at thedailyblog.co.nz that address Venezuela – the first by Chris Trotter is rather inaccurate, but comments point out the facts better, (among further inaccurate comments, it must be said) – so it’s clear a lot of kiwis are paying attention. The second one, which takes apart the National Party [Labour is in now] spokesperson on the subject is much better, has few comments however. Between the two I think it’s a good measure of NZ’s awareness at present. well, i love the waka and the haka, but knowing how much you and i value michael hudson, i’d hoped you’d take a gander. thanks fir the daily blog heads up, but i’m read out for now on VZ. over yonder it went to 98 comments, and i have a new one up…when something truly incendiary happens (soon?) i’ll post again. it’s all soooo messed up. ‘democracy in action’: R2P? we done got horizontal drifting snow in the night; seemed to be comin’ from your place on the planet. oh dear, sorry – my comment has gone away again – ’twas a good one too. i’ve been trying to free one of the six for half an hour or more. i keep opening another café tab, and it keeps not appearing. i’ll keep trying or add the text to one of your ‘oh dear’ comments. hang in there, ww. Yes, I’d already done so but it didn’t hurt to read it through again. This time I got interested in the Pompeo speech to the EU – so spent additional time on that. It certainly connects to your new piece above – his blatant assertion: “America intends to lead – now and always” is the unsaid answer to all developments that are unfavorably referenced in the security document as far as arms race strategies. Also the ‘America first’ attitude being used by Pompeo as the reason for junking treaties and cooperative efforts of the past is totally in tune with Hudson’s observation that the imperialist order is being rapidly dismantled by Trump in ways no terrorist could have imagined. Putin makes it clear that his defense moves are in reaction to what the US has done in dismantling the treaties, and the timeline seems to corroborate that. As does Hudson’s opening point that once the old mechanisms are dismantled, in favor of US oriented technologies, there will be a concerted effort by other countries to protect themselves, economically as well as by forming new alliances. It’s like a kid’s game of marbles. As I remember, the goal was to get all the ‘aggies’ on your little patch of playground asphalt. – at least that was one version I remember. Trouble was, those big aggies weren’t half as pretty as all the little multicolored ones.No left-wing party, no socialist, anarchist or foreign nationalist leader anywhere in the world could have achieved what he is doing to break up the American Empire. but yes, a lot of it was applicable, which is why i’d added a bit of it, and linked to it in the OP. more as i’m able.